Adding to the family of Olympus PEN micro four-thirds retro-style point and shoot cameras with sensors as large as the sensors in their DSLR line, Olympus unveils their newest member of the family, the E-PL1. It’s a simplified entry-level camera that’s a step up from point and shoot cameras, but more basic than the Olympus E-P1 and E-P2. Even better, the E-PL1 will start at $599 with the kit 14-42mm lens (compared to the entry price of $1099 for the E-P1). I attended an Olympus press event yesterday, where I was able to preview the new E-PL1 and compare it to the 2 previous PEN models. The E-PL1 is slightly lighter in weight 10.44 oz (compared to 11.8 oz), due to the body construction out of aluminum and polycarbonate plastic (the E-P1 and E-P2 are stainless steel metal), and slightly taller and thicker than the E-P1 and about the same height as the E-P2. The E-PL1, like the E-P2, also has a multi-pin port on the back. The E-PL1 felt lightweight and comfortable in my hands. The right side has a slightly raised grip for If you weren’t so into having to add on an accessory flash for low light, the E-PL1 comes with a built-in flash that can work wirelessly with Olympus’ flash system. The Olympus E-PL1 has a new feature called Live Guide, accessible when the camera is set to iAuto. The Live Guide interface allows you to navigate advanced photographic effects while previewing the image. I tried out these adjustments and saw how the image changed on the LCD screen before taking the photo. The photographic effects are labeled with common terms such as warm to cool (White Balance), bright to dark (EV compensation), blur background (aperture). I could see the Live Guide as being useful for beginning photographers who have no idea what aperture, shutter speed, white balance, EV compensation, etc. are, but would really like to be more creative with their photography. It’s also an added bonus to be able to preview these adjustments live before taking the photo. If you’re not so into the Live Guide help, you have the option of setting the camera to P (Program), A (Aperture), S (Shutter), M (Manual), just like on the E-P1 and E-P2. Some of the functions, features, and controls on the E-PL1 are different than on the E-P1 and E-P2. There’s no dial or subdial on the camera, instead there are 4 directional buttons for navigating and selecting menu functions. Also, like the E-P1 and E-P2, the E-PL1’s sensor is the same size as Olympus’ top-of-the-line E-3 DSLR. Ergonomically, this camera feels very good in my hands. It may not have all the bells and whistles I personally would like it to have (still no built-in viewfinder, less features and functions, more simplified menu system, ISO range only up to 3200 compared to 6400 on the E-P2), but it seems to be a great camera for an entry-level photographer wanting more functions than a point and shoot camera, but not as complicated as the E-P1, E-P2, or even the DSLR line of Olympus cameras. 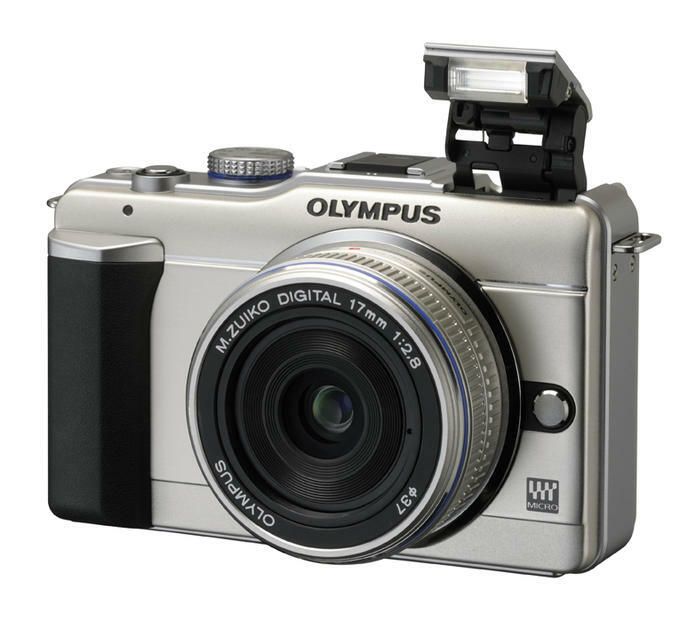 Photo.net’s partners have the Olympus E-PL1 available. Their prices are fair and you help to support photo.net. Olympus is expanding their lens line with two new Micro Four-Thirds lenses: the M.Zuiko Digital ED 9-18mm/4-5.6 (35mm equivalent 18-36mm—available in April) and the M.Zuiko Digital ED 14-150mm/4-5.6 (35mm equivalent 28-300mm—available in May). Both new lenses will feature internal focusing systems. The 2 current lenses available are the 17mm/2.8 and the 14-42mm (the kit lens for all three PEN cameras). CENTER VALLEY, Pa., February 3, 2010 — The new Olympus PEN E-PL1 is truly greater than the sum of its parts, with a surprisingly small camera body packed with technology normally found in bigger, bulkier and heavier professional Digital Single Lens Reflex (DSLR) cameras and High-Definition (HD) camcorders. This third-generation PEN is built for shutterbugs who always wanted better pictures and considered a DSLR, but were intimidated by the bulky size and complex interface. The new camera’s simple design and easy interface enable consumers to easily create amazing images never dreamt possible. It will make you wonder how Olympus managed to put all of these powerful features inside such a compact camera for only $599.99. The E-PL1’s new Live Guide interface simplifies great photography and gets the results you desire at the touch of a button. Want more vivid or muted color in your shot? Want warmer or cooler color? Want a brighter or darker subject, or a sharper or softer background? Or maybe you want to capture the fast-moving action of your subject with a little artistic blur, or perhaps freeze the action? Simply select Live Guide and press the up and down arrows on the back of the camera to slide through numerous photographic effects. Make adjustments and watch the LCD as the effects are made live—before the image is captured! Don’t worry about learning technical things like f-stops, shutter speed and white balance; jump right in by composing, adjusting exposure and more before the shot is taken. Instead of selling more expensive lenses that have image stabilization inside them, Olympus takes a different approach by having image stabilization built right into the body of the E-PL1. This means that any lens (Micro Four Thirds, Four Thirds and any third-party lens) attached to the E-PL1 will deliver blur-free images thanks to three modes of In-body Image Stabilization that automatically compensate for camera shake, including in low-light situations or when shooting without a tripod. Since the PEN cameras are the world’s smallest interchangeable-lens cameras with image stabilization built inside the body, you can take the E-PL1 with you and capture great images, and it won’t weigh you down. The E-PL1’s Continuous Autofocus (C-AF) Tracking and Autofocus (AF) Target Registration locks your subject into focus and constantly adjusts focus and brightness whether you or your subject is moving. With this mode, a simple push of the shutter release enables you to keep moving subjects in focus—tracking them from left to right and from front to back—within the frame, automatically ensuring that even active subjects, like kids playing sports, are captured clearly. If you’re just starting out with a camera that has interchangeable lenses, you don’t have to worry about dust spots on your sensor ruining the perfect image every time you change lenses. Spend more time shooting with the E-PL1 and less time worrying about dust with the proven Olympus Dust Reduction System that produces spot-free photos with the exclusive Supersonic Wave Filter, a patented ultrasonic technology that vibrates to remove dust and other particles from the front of the image sensor, capturing them on a special adhesive membrane every time the camera is turned on. The E-PL1’s Live MOS image sensor is complemented by Olympus’ TruePic V Image Processor, which produces clear and colorful photos using all the pixel information for each image to provide the best digital images possible. The image processor is noted for accurate natural color, true-to-life flesh tones, brilliant blue skies and precise tonal expression; it also lowers image noise in photos shot at higher ISO settings (ISO 100 to ISO 3200), enabling great results in low-light situations. You often can achieve greater photographic expression by framing a scene in a unique way. The E-PL1 provides four aspect ratios that serve as masks to frame your image to the desired proportions, including the standard 4:3 aspect ratio that is suited to an 8 × 10-inch enlargement; the 16:9 aspect ratio that will display beautifully on a widescreen television; and other popular aspect ratios, such as 3:2 and 6:6. The Multi-Aspect Shooting further expresses your creative vision when combined with in-camera Art Filters and Multiple Exposures. The E-PL1 streamlines the Olympus Micro Four Thirds PEN series form and is available in three new body colors, including Black, Champagne Gold and Slate Blue. Thanks to its compact size (4.51" W x 2.84" H x 1.63" D excluding protrusions) and light 10.4-ounce body, the E-PL1 won’t weigh you down when you’re on the go. Original text ©2010 Hannah Thiem. My impression is simple: this is the camera Olympus should have been released as the first m4/3 model! "Would like to hear if Canon G11's users think of switching to E-PL1. The price seems attractive :)" If somebody is happy with their current camera what is the point of switching to a newer model and in the process loosing some money on the deal? I think those cameras are pitched at different markets anyway. Blah. With the E-P1 still available and the recent release of the E-P2, I would have much rather that Olympus concentrate their efforts on offering more fast m4/3 prime lenses instead of more slow zoom lenses. Maybe a 12mm f2, a 25mm f2 and the like. Wake up Olympus! Enough slow zoom lenses already! I have owned the EP1. A real disaster, 100 iso not useble, 200 iso lots of noise. The lenses in the kit are not very good, to say the least. I am happy that I sold the kit and I will never buy an Olympus again. Nice looking camera and interesting concept. Strikes me these M 4/3s cameras are pitched at amatuers wanting to look like professionals trying to look like amatuers. Several things here: 1. Please remember that yes, you have the option of adding the VF-2, which IMO is unbelievably bright. I have the EP-2 and that VF is sharp. In fact, during the day, you "could" almost be fooled into believing that you were looking through an optical viewfinder. Even at night, the VF-2 retains its brightness and doesn't go to black and white unless it's totally dark (I haven't reached the point yet where it transitioned to black and white). 2. I'm personally glad to see Olympus doing this. And let's face it, all of the brands introduce new features and options - even if it's an entry-level product. 3. I shoot with over 50 different digital cameras - to include the G11, S90, LX-3, and so forth. But I've got to tell you that I've been absolutely delighted with the feel and results with the EP-2 (and I guess this would hold true for m4/3 in general). I'm so glad to see Olympus (who tends to be an innovator anyway) and Panasonic take the helms on this new format. 4. I'm looking forward to seeing what Nikon and Canon will bring to the table - if they in fact, see this new micro format as a viable option. So I say, "bring 'em on...as I love 'em all!!!!" This type of EVIL digital camera (electronic viewfinder inter-change lenses) is the future of high end digital cameras. SLR camera body structure is no longer the only choice to achieve WYSIWYG with any exchangeable lenses. Mirror less camera bodies can bright in a few attractive qualities such as high flash syn speed. And a quiet and stable camera body is great for micro-photography. I am eager to try one of these out. Am especially pleased to see that the EVF add on finder they made is useful in the field, as Mr. Herrman wrote. No one can snub one as a mere tourist if you own a PEN, I know that Spacey add is a little much,the UK one...This model throws a bunch into a small package. They are getting better at it all the time. Leo says "I have owned the EP1. A real disaster, 100 iso not useble, 200 iso lots of noise" Disaster? 100/200 not usable? Leo you are the only person I know of that has complained about noise on that camera. Complaining about slow autofocus or lens choices might be a legit beef but every review I've seen has the EP1 looking good right up to 1600. I would love to see some pancake primes from either Olympus or Panasonic. Mainly wides - 10, 12, and 14. M. Reichmann at Luminous Landscape has just pretty much trashed the Pen 2 IQ and by extension the Panny versions of the same sized cameras. Not owning one yet (or maybe never),I would like to hear about his review from the author of the original review here and all other commentators on the subject. I am looking forward to buying a E-PL1. I agree with most here that Olympus and Panasonic should focus more on quality pancake lens like Pentax's DA series. A small kit consisting of E-PL1 and a pancake lens makes a great photographic tool. I will mostly buy a Panasonic 20mm f1.7 to go with my E-PL1 but really wish they had more choice in fixed focal length lenses. I think in competing with Canon/Nikon/others, Olympus and Panasonic already have attention of plenty of photographers who appreciate quality but want good portability. The E-PL1 is priced right to entice the new hobbyist or someone looking to add another camera to their existing high-end Canon/Nikon dSLR. What will keep the newbies in the m4/3rd fold and convert the Canon/Nikon/others to m4/3rd will be quality lens. The quality and size will most likely draw new customers to the market who were probably intimidated by the size and bulk of regular dSLRs. offering a cheaper body is indeed a smart move. there are a few like us who would love to try our old rangefinder lenses on this digital body. in truth, if and when the next model comes out, i intend to buy this cheap and sell on my rangefinder gear! well done olympus. OMG i am so glad that Olympus did this. I have really wanted a Pen with IS because i plan to use all of my many Old Manual lenses, and I was about to settle for the G1 because of the price, but finally they busted this model out that blows away the G1 in features and for a comparable price. Thanks Olympus! Despite whatb I considered a luke warm review by Reichmann I bought the Pen 2 with the Panasonic 20mm lens for greater sharpness. I haven't had the time to put it through all its paces, but treating it like one would a Leica, that is, using it as simply as possible without all the cutsie possibilities on offer-- I find the pictures rich and detailed. With a little post processing in photo shop the pictures are just fine, not up to my Cannon 5D II perhaps, but I don't expect to print much more than 11x16 anyway from this camera. Taking it and the Canon on a two week trip today, so more later on the plus side, I hope. The book it comes with is nearly incomprehesible without a language course in Olympus speak. Thanks for the review, I'm def looking forward to using the E-PL1 as I've only used the E-P2. Overall I've been really happy with the E-P2 so I would not expect much less for this camera in terms of image quality. >>Ned Bagno [Subscriber] , February 04, 2010; 11:24 P.M. One small correction to the article... The E-PL1 sensor is not the same as the E-3's 10.1 m sensor...<< Uh... excuse me but could you please quote where the author says the E-PL1 sensor is the same as the E-3 10.1 m sensor? What the author said is that the sensor is the same as the E-30 and E-620. I couldn't find anywhere in the article where a claim was made that the sensor is the same as the E-3. Oh no,.. the EPL1 may be a disaster "to some". Those who intend to use the 20mm 1.7 panny lens for bokeh in bright daylight - May be in for an unpleasant surprise. In GF1, the shutter used is 1/2500- 1/3000 in bright daylight shooting - with aperture wide opened. The EPL1 shutter is 1/2000 max, the F stop would be forced down to F4-F5. Bokeh would be reduced if still present at all. I was eager to purchase an EPL1 for my wife..... thank God I took my GF1 out today and it was sunny. Back to EP1/EP2 drawing board. If my analysis is wrong, pls let me know....!